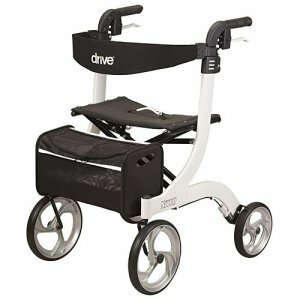 The White Nitro Euro Style Rollator by Drive Medical offers the best in comfort and convenience. The frame is made of a lightweight aluminum material making the rollator very mobile and easy to use, but still durable and designed to be used in any occasion. The large front wheels allow the Nitro Rollator to be used on any terrain, indoors or out. The item also conforms to a number of people who need to use it. 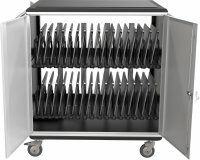 The flexible height adjustable removable back and the height adjustable ergonomic handles allow for many customization options for convenience. The Nitro Rollator is also easy for transport due to its frame which can be folded up with one hand and a durable fold-up handle built in to the seat. The Nitro Euro Style Rollator is perfect for anyone who wants a convenient four wheel rollator that operates virtually anywhere.